On the upper right you'll see the solar power array powering the station, and above that the anemometer for wind speed and direction. On the left, the white box with slatted sides is the government certified maximum/minimum thermometer, which in a few target locations in Eastern Oregon contains a special thermometer reading to a full 60 degrees below zero. The silver bullet measures rainfall. These type of stations' data reaches the State recording system in various ways, and many report themselves via radio, often solar-powered. 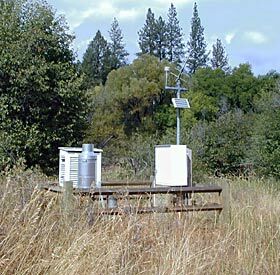 Remote reporting stations have begun to supplant good, old-fashioned human dedication in the remote areas of Oregon, but many "Cooperative Weather Observers" still perform their daily duties around the State with high dedication and persistence in the face of often nasty or even hostile weather conditions of rain, wind, snow and blizzards. 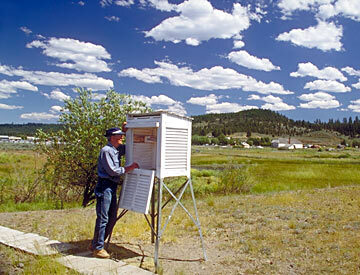 Below is Co-op Observer John Saunders at work in 1994 at Oregon's coldest station, Seneca,Oregon, 4700 ft. Please click the link below to meet Howard Lohf, a famous Seneca Cooperative Weather Observer. In 1933, he recorded Oregon's all-time record low of 54 below zero at Seneca, yet so low-profile was his "second job" as a weather observer that he did not become aware that he was famous for a year or more after the record-setting event! 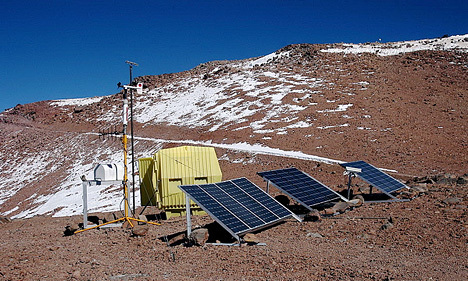 Remote-recording weather stations can be likened to our hardy Rovers on Mars. The solar-powered station below inhabits a very harsh region of Planet Earth that has several similarities to Martian surface conditions--- air so thin that normal Earthlings cannot live/work without supplemental oxygen/pressure-- air so dessicating that human skin and mucus membranes quickly become cracked and painful-- dangerous UVB rays so strong that mid-summer on the beaches of Florida pales in comparison -- temperatures that rarely rise above the freezing point of water -- a virtual lack of rainfall-- skies always clear-- cloudiness a rarity. This will be the site of a state-of-the-art astronomical telescope facility that is a collaborative effort of Cornell University, the California Institute of Technology with its Jet Propusion Lab, the University of Colorado, a Canadian consortium led by the University of British Columbia, and the UK Astronomy Technology Centre on behalf of the UK community. The type of telescope will be a "submillimeter" telescope in the 25-m class, using a "segmented mirror" design. Image is compliments the Cornell website.